Judy picked up her first ball of yarn when she was 6 years old and has been knitting ever since. Using her extensive experience in every type of knitting, from hand knitting to machines, from simple garter stitch to the most intricate lace patterns, Judy can help you solve your knitting problems, gain confidence to tackle more challenging projects or learn how to adapt patterns for a better fit or look. Outgoing and cheerful, Judy is always eager to help you with any aspect of your project from yarn and needle selection to recovering from mistakes you thought were hopeless. Having trouble interpreting a new pattern? Judy’s experience as a Technical Editor for many designers will help you read between the lines and understand how to make the pattern work for you. She has frequently knit samples for designers that have appeared in Creative Knitting, Knit Simple and Noni Designs as well as for many yarn shops across the country. Judy has lived in 7 States and Japan, moved 17 times, cruised the world along with the rivers of Europe and visited 55 countries, and despite her extensive travel experience she visits each port with the enthusiasm of a first timer but with the experience of a veteran. Cruising is fun and knitting while cruising is even more fun. Judy attended Cerritos Community College and the University of Hawaii. She lives in Imperial Beach, California with her husband, Pete. Late in his Navy career, Pete and his wife, Judy, discovered civilian cruising – and they loved it from their very first Alaska cruise in 1998. After many civilian cruises, Pete and Judy recently completed their first World Cruise aboard the MS Amsterdam. You can read about their experiences on Pete’s travel blog www.theinsidecabin.com which is focused on World Cruising and Knitting. An adventurous traveler, Pete knows his way around the world and enjoys leading small tours and excursions. He has led tours to the Taj Mahal in India and Angor Wat in Cambodia among many other places. He spent 3 years as a Docent aboard the USS Midway Museum in San Diego. Pete has led numerous Yarn Crawls with Judy and knows how to keep things organized and on schedule, but while still having fun and staying flexible. He is an aeronautical engineer by training and understands technology and is eager to help others with any general issues with computers, smart phones and internet connectivity. Judy has frequently knit samples for designers that have appeared in Creative Knitting, Knit Simple and Noni Designs as well as for many yarn shops across the country. 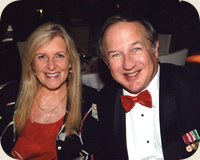 Judy attended Cerritos Community College and the University of Hawaii, and Pete attended The Ohio State University.